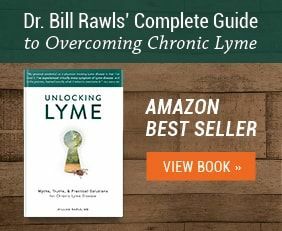 Lyme disease may be the best known tick-borne illness, but it’s not the only one you should be concerned about. Ticks carry all sorts of infectious human diseases, including some that are potentially deadly. 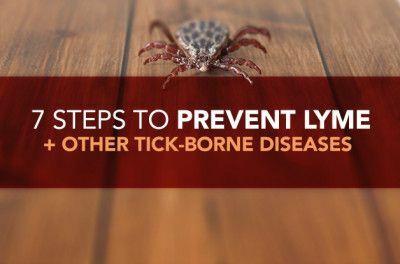 Beyond Borrelia burgdorferi, the microbe associated with Lyme, the three other tick-borne bacteria you should have on your radar are ehrlichia (which causes Ehrlichiosis), anaplasma (responsible for anaplasmosis), and rickettsia (the cause of Rocky Mountain Spotted Fever). All three are gram-negative (double cell wall) bacteria, and they’re intracellular, meaning they live inside cells, though each prefers a different type of cell. 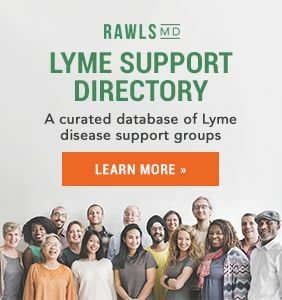 The good news is, these microbes are much less common than borrelia and top Lyme coinfections like mycoplasma and bartonella, and in fact, they’re rarely a Lyme coinfection (5% or less of ehrlichia and anaplasma cases occur with Lyme). 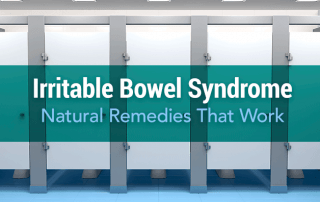 The bad news: They have a higher potential for causing severe and life-threatening illness. Here’s what you need to know about ehrlichia, anaplasma, and rickettsia, including signs of infection, diagnostic approaches, and the best treatments. The signs of infection with either ehrlichia, anaplasma, or rickettsia are remarkably similar. With milder infections you may experience no symptoms at all, or it could manifest as mildly flu-like. But it is possible for severe, acute illness to occur, especially in those infected with rickettsia. And certain people are at higher risk of severe infection and even death, including those over age 50; those who have HIV; and/or those with depressed immune function due to another factor such as taking corticosteroids or other immunosuppressive drugs, cancer and cancer therapy, or splenectomy. 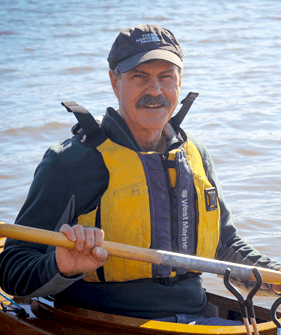 It also seems that men are more vulnerable, as the ratio of men to women with these illnesses is 2:1 (perhaps because men are more likely to frequent the outdoor areas where ticks thrive). 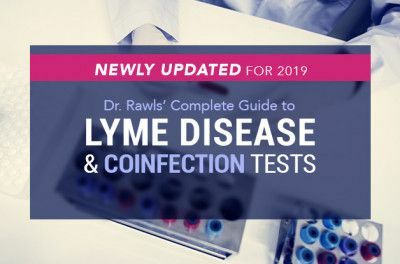 Hallmark symptoms of severe infection include high fever, chills, and muscle aches, and they generally start an average of 12 days (5 to 21 days) after a tick bite. 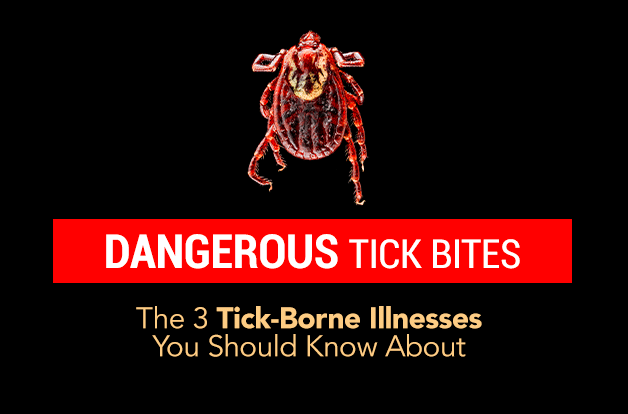 History of tick bite is the number one tip-off to infection, but because tick bites are painless and people are often unaware of being bitten, that history is not always helpful. Conjunctivitis (eye infection) and rash are also highly common with both RMSF and ehrlichiosis. About 60% of children and 30% of adults see a rash associated with Ehrlichiosis, which appears as small, red, flat patches (macules), with small raised bumps (papules) in evenly distributed clusters. Rash mainly occurs with the Ehrlichia chaffeensis strain of ehrlichia; it’s less common with Ehrlichia ewingii and Ehrlichia muris-like strains. It should be noted that a similar rash can occur in many other viral and bacterial diseases including measles, dengue fever, parvovirus B19, Epstein-Barr virus (mononucleosis), cytomegalovirus (CMV), borrelia (Lyme disease), and many others. 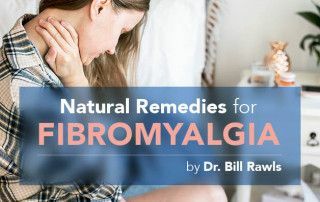 It can also occur as a reaction to drugs or toxins. A sunburn-like rash (erythroderma) is also possible with E. chaffeensis, but less common. The vast majority (90%) of people with Rocky Mountain Spotted Fever develop a rash that appears as pink, flat, non-itchy small “spots” (macules) that are densely packed and widely distributed on the wrists, forearms, ankles, and buttocks, and sometimes on the palms and soles of the feet. 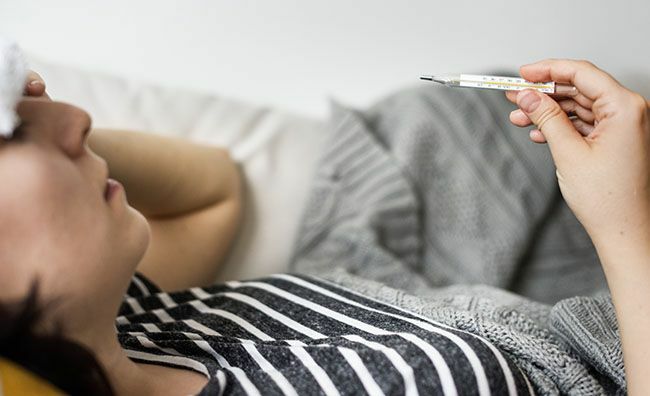 It generally appears two to five days after fever starts, but can occur later in the course of illness, even after treatment is started. In later stages with progressive disease, the spots progress to a red or purple color (petechiae). Chronic infection with all three of these types of microbes is categorized by subclinical phases (no symptoms) that can last months or years, followed by episodes of primary symptoms. Ehrlichia and anaplasma are more likely to be associated with relapsing disease than rickettsia. Rickettsia is one of the more virulent tick-borne microbes: On the virulence scale of 1-10, with 10 being most virulent, rickettsia is about a 7, putting it on par with pneumonia. 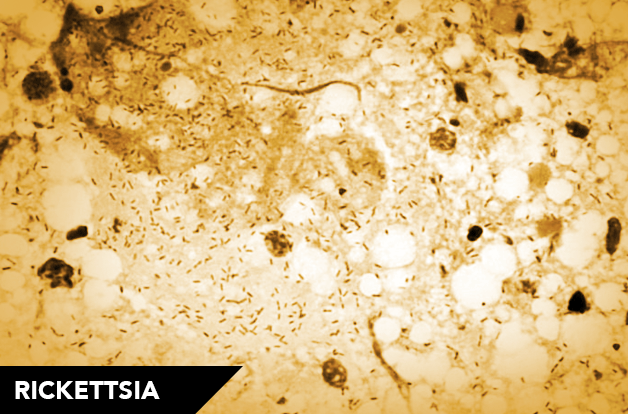 If left untreated, rickettsia can cause potentially fatal illness. Even very healthy people can become severely ill. Those affected with severe disease can have long-term complications, especially if not treated early. Rocky Mountain Spotted Fever tends to occur alone as an isolated infection; it’s not typically a Lyme coinfection. Symptoms are typically more severe than those caused by Ehrlichiosis and anaplasmosis, and more apt to occur in healthy individuals. The R. rickettsii strain is transmitted by the American dog tick (Dermacentor variabilis), which is most commonly distributed in Midwestern states east of the Rockies; the Rocky Mountain wood tick (Dermacentor andersoni); and the brown dog tick (Rhipicephalus sanguineus) in Arizona. However, RMSF can occur in any state. The highest concentration of cases occurs in a band from North Carolina to Oklahoma. Different species and strains of rickettsia cause similar syndromes around the world. Though it is widely distributed, infections are much less common than other tick-borne microbes. The primary difference between rickettsia and ehrlichia and anaplasma is the type of cell infected. Rickettsia has a preference for infecting cells that line blood vessels (called endothelial cells), making it much more virulent. Infection of endothelial cells results in severe vasculitis (inflammation of blood vessels). Fluid leaks into tissues causing swelling and edema, and vessel damage constricts blood flow and causes blood clotting. Loss of circulation in extremities can result in damaged toes and fingers, sometimes causing partial paralysis and/or requiring amputation in extreme cases. Vasculitis in organs, including the brain, can result in serious and sometimes permanent complications. Rocky Mountain Spotted Fever can also cause long-term problems in children, including cognitive delay, fine motor impairment, and persistent foot drop. Acute infections should be treated aggressively with antibiotic therapy. Though ehrlichia infections are considered to be a newly emerging microbial illness, the fact that it is so widely distributed across the globe (in both animals and humans) suggests that it has been around for a while. More likely, as with other stealth microbes, it is just being recognized as a significant cause of disease. In other words, people have been getting sick with ehrlichia for a long time, but it has been only in the past 30 years that ehrlichia has been recognized as the cause. The primary cause of Ehrlichiosis (formerly called Human Monocytic Ehrlichiosis) in the United States is the E. chaffeensis strain. It lives inside cells of a host and infects white blood cells of the body, preferentially monocytes and macrophages. After infection, E. chaffeensis stimulates formation of cyst-like structures (vacuoles) called morulae, inside the white blood cell. Nestled inside the morulae, the microbe is protected and can multiply. Ehrlichia organisms are spread throughout the body by way of infected white blood cells, via blood and lymph systems. The microbe is able to thrive inside macrophages that are fixed in bone marrow, spleen, lymph nodes, and hepatic sinusoids (a type of blood vessel). Inside these isolated niches, it is protected from the immune system. It is also found in meninges of the brain, other brain tissues, lungs, kidneys, intestinal tract, and heart. There are seven species of ehrlichia worldwide known to infect humans (E. chaffeensis, E. canis, E. ewingii, E. ruminantium, E. mineirensis, E. muris, and a new muris-like species). Different species cause similar illnesses with similar symptoms. There are many strains (genotypes) of each species. Two other species of ehrlichia, E. ewingii and E. muris, cause ehrlichiosis in the US, but are much less common than E. chaffeensis. Most cases of ehrlichiosis occur April through October. Two-thirds of infections are asymptomatic or associated only with mild flu-like symptoms that resolve spontaneously without any therapy. Severe and even life-threatening illness is more apt to occur in immunocompromised individuals, but can also occur in healthy people. In cases of severe ehrlichiosis, 48% are ill enough to require hospitalization, and 17% have life-threatening complications (mostly neurological). The fatality rate is 3%. Ticks are the predominant vector for ehrlichia. It’s most commonly found in Mid-Atlantic and Southeast US, with the highest concentration in a band stretching from North Carolina to Oklahoma (South, South-Central, Southeast). This band mimics the distribution of the lone star tick (Amblyomma americanum), a primary carrier of ehrlichia. Ehrlichia is also transmitted by black-legged ticks (Ixodes scapularis) and western black-legged ticks (Ixodes pacificus), along with other tick species worldwide. Besides ticks, other vectors are possible for ehrlichia, including fleas and other biting insects. Ehrlichia chaffeensis is commonly found in cats and dogs (60%). Interestingly, some owners are seropositive for the same strain of ehrlichia as their pet. Ehrlichia is also found in foxes and other wild mammal populations. Transmission by blood transfusion and organ donation has also been documented. Anaplasma is an obligate intracellular bacteria, meaning that it’s entirely reliant on intracellular resources to reproduce. It infects white blood cells and multiplies within morulae (those cyst-like structures). Anaplasma prefers neutrophils (also called granulocytes), but can also infect other kinds of white blood cells. 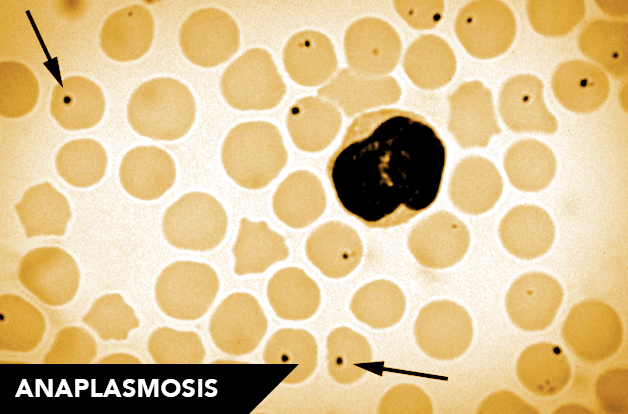 Anaplasma phagocytophilum causes anaplasmosis (formerly called Human Granulocytic Anaplasmosis). 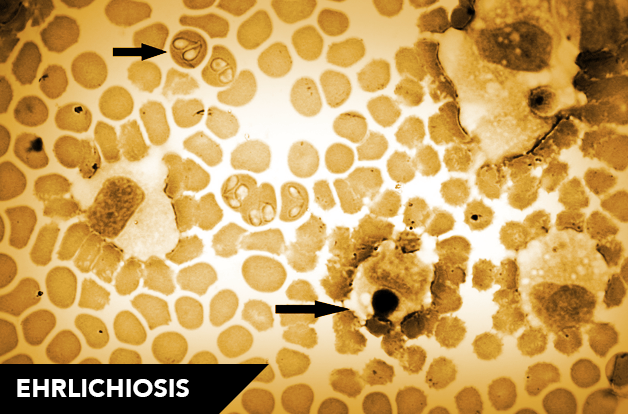 Anaplasmosis has very similar characteristics to ehrlichiosis, but tends to be less severe. Hospitalization with severe infection is much less likely, and neurological complications are much less common. Associated fatality is only 1%. Anaplasma is transmitted by black-legged ticks (Ixodes scapularis) in the Northeast and Upper Midwest, and western black-legged ticks (Ixodes pacificus) in Northern California — most commonly by nymph and adult ticks. It has common overlap with typical ehrlichia areas, and is also spread by other species of ticks worldwide. Person-to-person transmission is also possible through direct contact with blood, blood transfusions, respiratory secretions of someone acutely infected, and blood contact with infected animals (hunters cleaning carcasses). A few cases of mother-fetus transfer in the womb and one case of transfer via breast milk have also been documented. Diagnosis is challenging, because these three diseases look alike on clinical presentation and also resemble other common infectious diseases, like the flu. Having a high level of suspicion is critical to initiate therapy early in the course of disease, especially with RMSF. Any person presenting with shaking chills, high fever, and low back pain should be considered for one of these diseases, especially in endemic areas (where infection is common), with or without a known tick bite. Giemsa blood smear test, which involves direct visualization of morulae within white blood cells. This test is not valuable for diagnosing rickettsia, and because only 0.1% to 0.2% of white blood cells are infected by ehrlichia and anaplasma, this is not generally an effective method of diagnosis. Indirect Immunofluorescent Assay (IFA), which is looking for a four-fold rise in antibody titer (IgG). The first sample should be taken as early in the disease process as possible, and the second sample taken 2-4 weeks later. Another type of antibody, IgM, rises at about the same time as IgG and can stay elevated for a long time; IgG is more reliable for diagnosis. For ehrlichia, anaplasma, and R. rickettsiae, the IFA does not detect early disease. Therapy should be initiated before results are available if infection with one of these microbes is suspected. Polymerase Chain Reaction (PCR). This test detects microbe DNA in blood samples and is species and microbe specific. PCR is the best test for acutely diagnosing these microbes, but a negative test should not prevent therapy if suspicion is high, as the test is not foolproof: It’s between 60-85% effective for diagnosing ehrlichia, and 70-90% effective for diagnosing anaplasma. PCR from a blood sample is less valuable for diagnosing RMSF, because concentration of microbes in the blood is so low. PCR for rickettsia done from a skin biopsy sample at a rash site, however, can be positive in up to 70% of cases. Immunohistochemistry (IHC). This test detects antigens of the microbe in tissue sections. The test requires a biopsy of the spleen, lymph nodes, bone marrow, or liver. Results are reliable, but the test is not often used because it is very invasive. Having a high level of suspicion is important for early diagnosis. These are not illnesses to mess around with. They should be treated aggressively with conventional antibiotics. Diagnosis is based on clinical signs and symptoms and confirmed by labs after treatment is initiated. 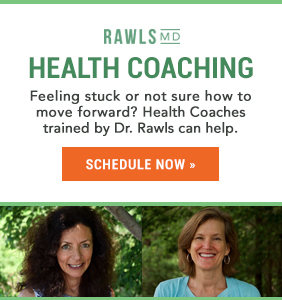 Labs are not helpful for the first two weeks when acute symptoms are most pronounced. Serious complications are more apt to arise if infections are not recognized and antibiotic therapy is delayed. 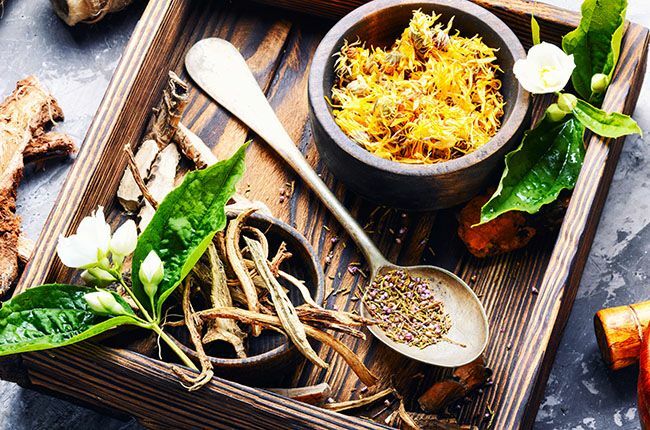 Herbal therapy should not be a primary therapy for these infections, but it can be used as supportive therapy. 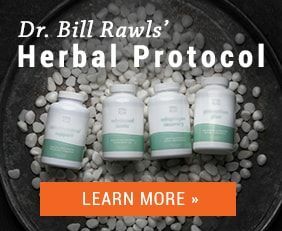 For instance, I’ve developed an herbal protocol that’s ideal for supporting antibiotic treatment and promoting immune system restoration. Standard treatment for adults is 100 mg of doxycycline twice daily for 30 days or until three days after symptoms subside completely. Failure to respond to doxycycline (decreased fever) acutely is an indication that an acute tick-borne infection is not present; instead, it may be a virus or babesia infection. Resistance is high with any other antibiotics. For RMSF: 12.5 mg/kg body weight of Chloramphenicol orally every six hours. It also can be administered intravenously. Use of this antibiotic is associated with a high potential for side effects. Prophylactic treatment for an asymptomatic tick bite is not recommended by the Centers for Disease Control. 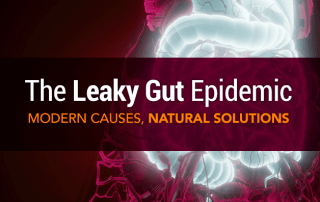 It is considered ineffective and may simply delay onset of disease. 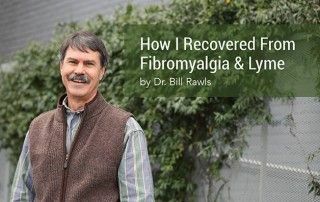 This stance is controversial, especially because asymptomatic individuals can become chronic carriers and develop relapsing illness later if immune function falters. A more severe course may require acute treatment with IV antibiotics. 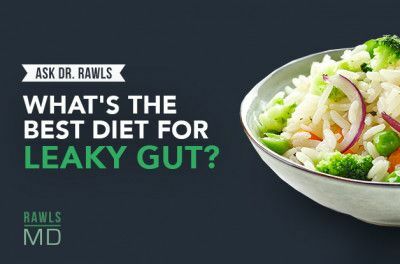 When chronic disease occurs with these bacteria, it’s in the form of relapse of acute symptoms after prolonged periods without symptoms. In this way, ehrlichia, anaplasma, and rickettsia are much less like other stealth microbes. Relapses should be treated with antibiotic therapy, like primary disease. While ehrlichia, anaplasma, and rickettsia are less common tick-borne infections, they can be serious and even life-threatening. Whether you remember an insect bite or not, if you suspect infection due to symptoms and time spent in a high-tick area, consult your doctor as soon as possible. 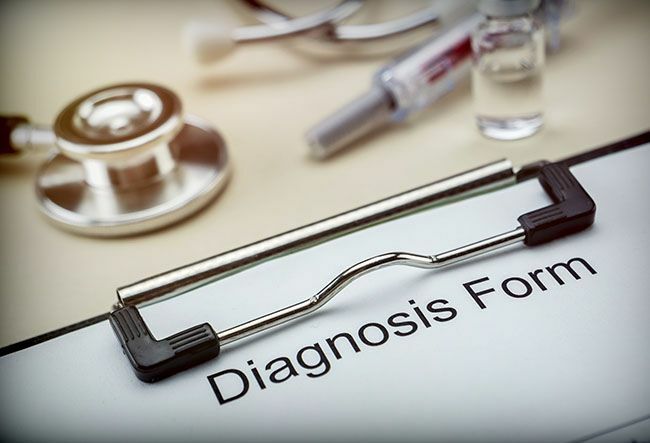 Early diagnosis is vital to restoring your health.